The alternative design using steel has made it possible to obtain the aesthetic and functional goal which is to minimise the visual impact on the surrounding landscape, while also providing an economic and durable solution. A radical innovation is the re-assessment of the conductor/cable arrangement. 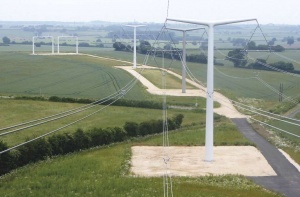 The prismatic configuration of the cables allows a reduction in the pylon's height of more than 30%. The footprint of the power lines, as well as the electro-magnetic field (EMF) radiation, is thus reduced. The most remarkable characteristic of the T-Pylon design is that all conductors are carried by a single attachment point. Traditionally, such a structure would have three separate arms - each carrying an individual conductor. The pylon is made from S355 steel plates that are curved and welded to form cylindrical sections. The shaft is fabricated in either one or two pieces according to the length needed, the requirements for hot-dip galvanizing, and transport limitations. The steel plate thickness used for the shaft is optimised according to the design load cases and varies from 22mm at ground level to 14mm at the top. At the end of the arms another node connects the insulator configuration to the arm in an aesthetically pleasing way. Again, the node is connected to the arms by non-visible internal bolts. 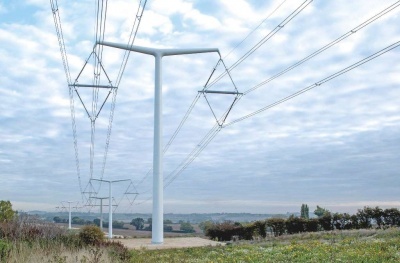 For the UK market, the pylon is hot-dip galvanized and painted light grey. This duplex coating system gives the pylon an expected lifespan of at least 80 years. 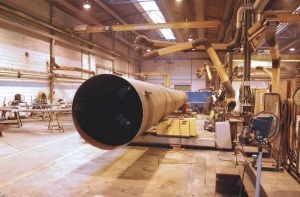 For other markets the pylon can be produced in stainless steel or weathering steel. The new designs have significantly reduced maintenance requirements compared to traditional lattice towers. The durable coating system and lack of edges and bolted connections increases the future maintenance intervals and makes re-painting the towers much faster. Also, no anti-climbing devices are needed for the monopole shaft, which would otherwise require frequent replacement. The result is a family of compact pylons which can be deployed in sensitive landscapes, with prefabrication enabling consistent finish, smaller land take and speedy erection. This is a steelwork design classic.